Biofabricators have successfully managed to make tiny, complex scaffolds that mimic the collagen fibre networks that form the human eardrum. The eardrum is how we hear - it's a thin, but tough membrane which separates the inner and outer ears. It's made of collagen fibres that are very precisely aligned so that sound energy that bounces off it is transmitted to three tiny bones which send that data to the brain. Perforated eardrums are a relatively common occurrence - especially in children. Most damage heals on its own, but severe injuries require replacing the eardrum entirely. Until recently, that has been done by taking the patient's own tissue or tissue from a donor. Because that tissue isn't quite the same as that which it's replacing, hearing is often left impaired. But this new method involves creating scaffolds out of polymers, which real eardrum cells can then can grow on. They're about 15 mm wide, but just 0.1mm thick. 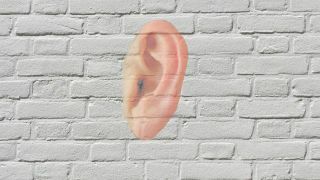 'The eardrum has a complex structure with collagen fibres arranged precisely to interact with sound waves," said study co-author Serena Danti from the University of Pisa. The international team of researchers published their work in the journal Biofabrication.